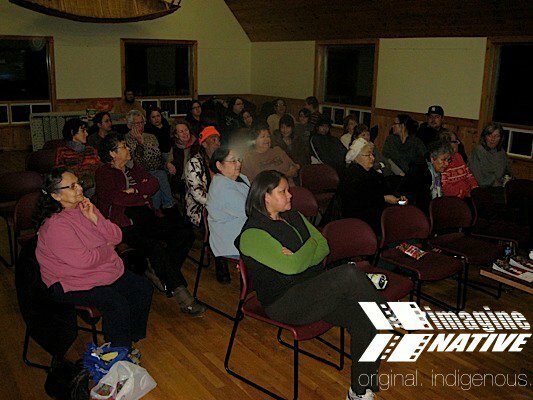 imagineNATIVE is active year-round with numerous presentation, educational, and professional development activities. These include the annual imagineNATIVE Film + Video Tour, the indigiFLIX Community Screening Series, and co-presentation screenings and workshops with partners across Canada and around the world. We love to collaborate! Please contact us if you'd like more information about our year-round activities or to partner with imagineNATIVE in your community! The imagineNATIVE Film + Video Tour is imagineNATIVE's largest initiative outside of our annual Festival. The Tour brings Indigenous-made film and video works, community engagement activities, and youth workshops to communities across Canada. To inquire about having the imagineNATIVE Tour visit your community, please contact: tour@imagineNATIVE.org or +1 416.585.2333. The indigiFLIX Community Screening Series is imagineNATIVE's initiative that brings Indigenous-made films and videos to community centres throughout the Greater Toronto + Hamilton Area (GTHA). Free to the public, indigiFLIX presents works from our past Festivals to Indigenous and non-Indigenous community centres and gatherings. We are looking for new partners and are particularly interested in expanding indigiFLIX to multi-ethnic community centres across the GTHA and to reach New Canadian audiences. Please contact us to partner or to inquire about indigiFLIX. Learn more about indigiFLIX by CLICKING HERE. indigiFLIX screenings will be announced via our e-Bulletin and our social media, and will appear in the EVENTS section of this website. Bring Indigenous-made films and videos to your community! Throughout the year, imagineNATIVE partners with numerous festivals, organisations, and institutions across Canada and around the world! These include imagineNATIVE-programmed screenings at libraries, universities, or community centres and co-presentations with other festivals. We love sharing our programming with your community or event! imagineNATIVE can provide ready-made shorts and feature film programmes or we can create a custom-made programme to match your interests or focus. For example, we can provide thematic programming that speaks to issues of reconciliation and the impact of residential schools, or we can provide programming based on genre (dramatic shorts, sci-fi, etc.) or form (documentary, animation, etc.). As part of our commitment to Indigenous artists, we ask that the host organisation ensure industry-standard artists fees apply (imagineNATIVE can facilitate payment to artists; 100% of the fees go to the artist or their appointed distributor). With custom-made programmes, a modest curation fee could apply in addition to administrative costs (e.g. shipping, creation of screening DVD, etc.). Please contact us at the general email below for complete information and details.